Patricia lives part of the year in Derbyshire, England on the edge of the beautiful Peak District National Park, and part in Montejaque, a lovely Andalucian mountain village in Sierra de Grazalema Natural Park in southern Spain. Patricia has painted for most of her life – mainly in watercolour. However, it was only since she retired that she found more time to indulge her passion for art. Early in 2013, seeking inspiration, she changed media to acrylics, adding all sorts of different materials to create drama and texture within her work. This changed her style of painting and gave an element of abstraction which she loves. Patricia’s paintings are not always not an exact representation of any one place, but the lovely Peak District in England and the varied landscape of Andalucia is where her inspiration originates. She memorises the landscape - its atmosphere, the colours and the rich textures, and recreates the mood back in her studio. Often the flow of the paint or the added textures suggest a feature of the landscape which helps to give her work its individuality and vibrancy. Each piece of work captures the ‘essence’ of places she visits. She hopes that you will discover ‘your’ special place in her work. In the past few years Patricia has held several successful exhibitions in Spain, and had work accepted in 'Open Exhibitons' in the UK, she has work in galleries in the UK, and has recently been invited to be 'Guest Artist' at two galleries in the Peak District. 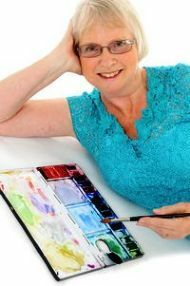 She is a founder member of the Derbyshire Artists Guild. Patricia has her work in private collections in the UK , Spain, USA & Canada.